As I mentioned in a previous post, my daughter has joined Marching Band this year. It is something she has wanted to do for several years but until now has not been able to fit it into her schedule. Last year she was presented the opportunity to be in the honors orchestra program. She’s played violin in the school orchestra programs since third grade. Her scores from her NYSSMA solo fest have qualified her for All County and Area Allstate Orchestra. Years ago she wanted to be in BOTH orchestra and band, but this was not an option at the time. For a while she played on the field hockey team, a sport she enjoyed. 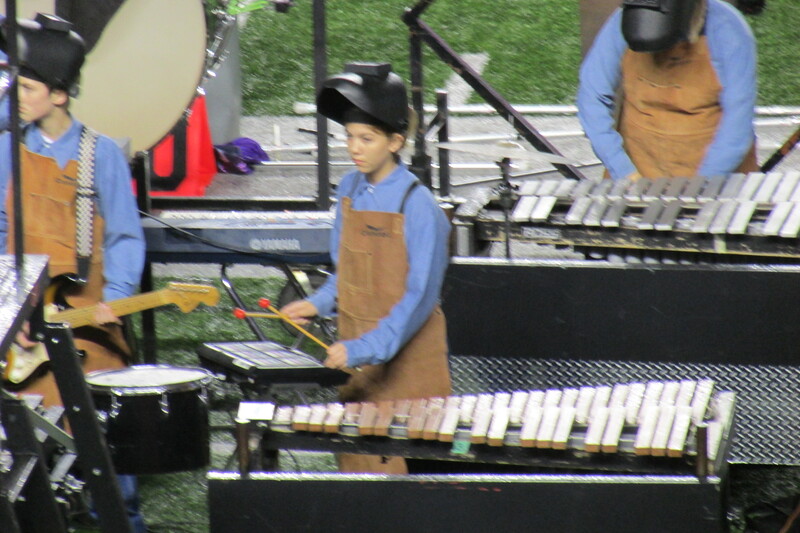 She;s always liked running around and hitting things with sticks, so it makes perfect sense that when she joined Marching Band she ended up playing in the percussion “pit”. This year’s show is called “Metal”, a conceptual piece which plays on the themes of Metal as an essential resource and style of music. As one student from another band commented during a recent competition, “Wow, your band marches to Aerosmith. 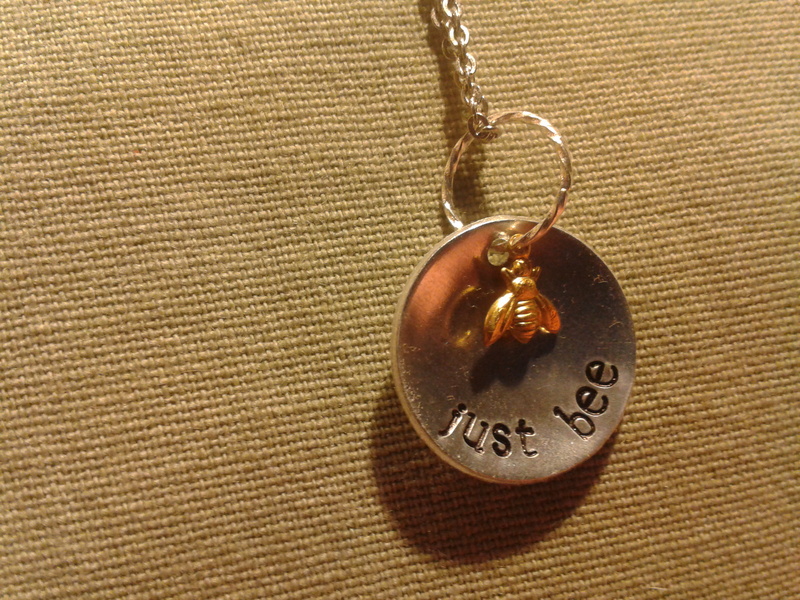 That is unbelievably cool.” The show itself is indeed unbelievably cool. The guard uses metal poles, flags in metallic colors and shiny swords. 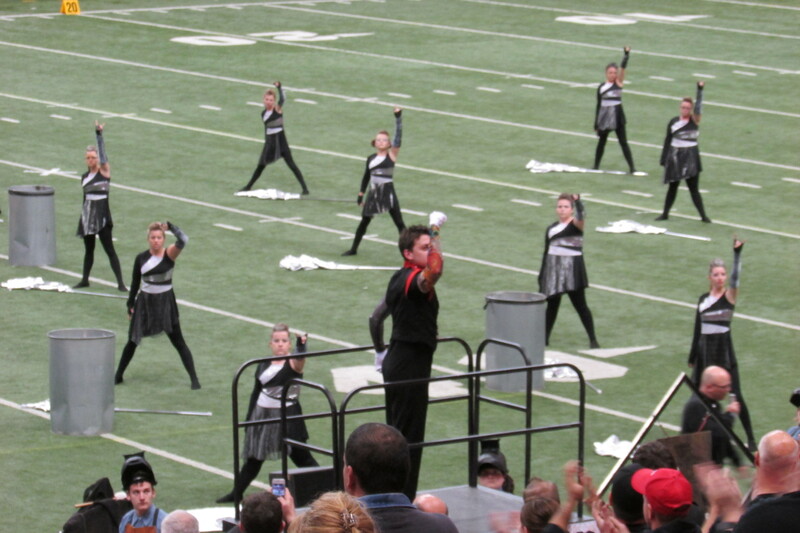 The band uniforms have had one sleeve removed so the kids could all wear tatoo “sleeves” on the exposed arms. 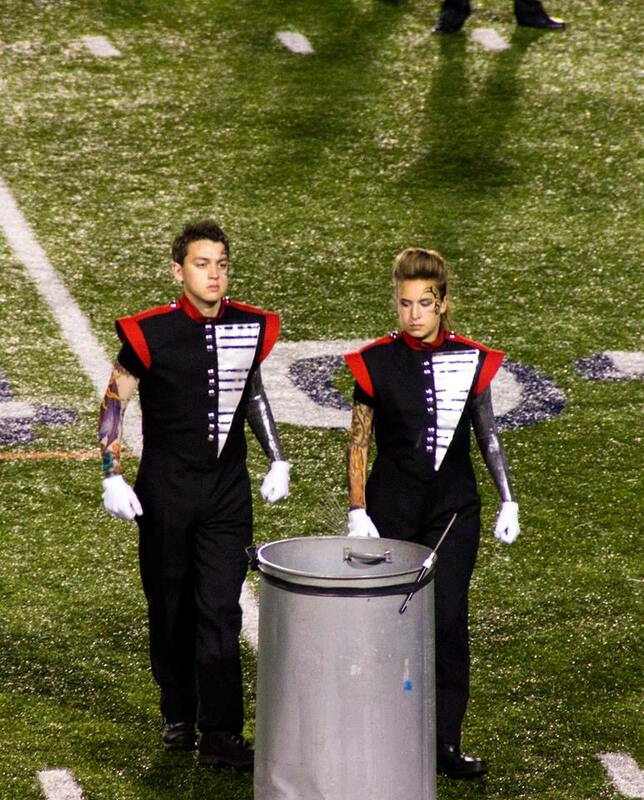 The senior and junior drum major (whose uniforms are completely sleeveless) not only have a tatooed arm, their other arm is wrapped in silver fabric, giving a bionic appearance on one side. The back of the field features several multi-story scaffolds with decks on which several of the pit percussion students perform. 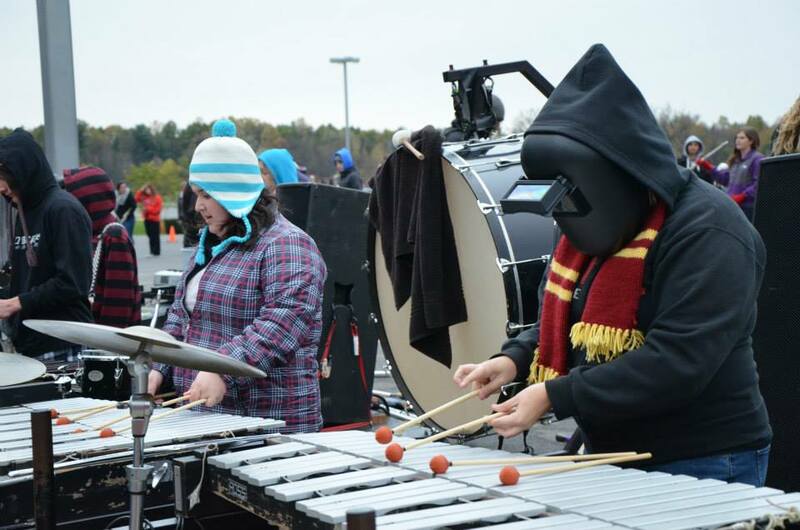 Along the front row, among the usual assortment of percussion instruments like marimba, xylophone, chimes and cymbals are some unusual percussion elements: hollowed oxygen tanks, metal bells made from weights and an anvil….yes you read that correctly an anvil. 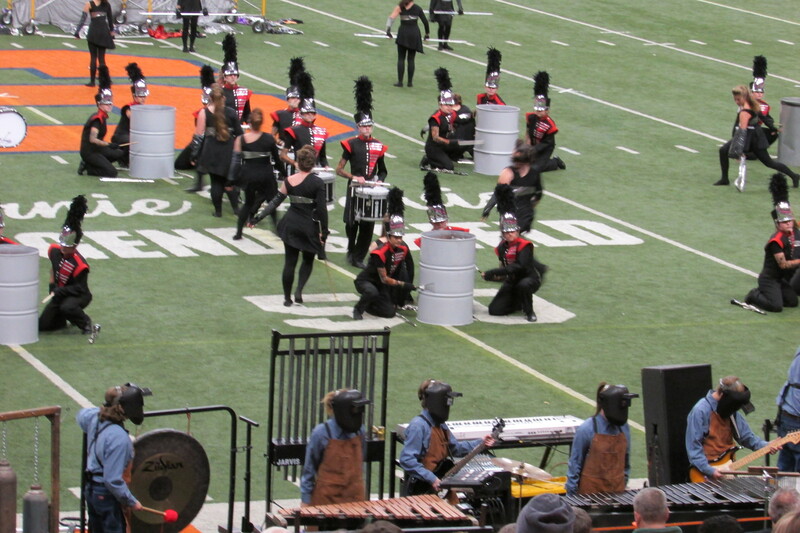 Oh I almost forgot, there are a series of oil drums which are used at one point in a “Stomp” style percussion “conversation” with the drumline. 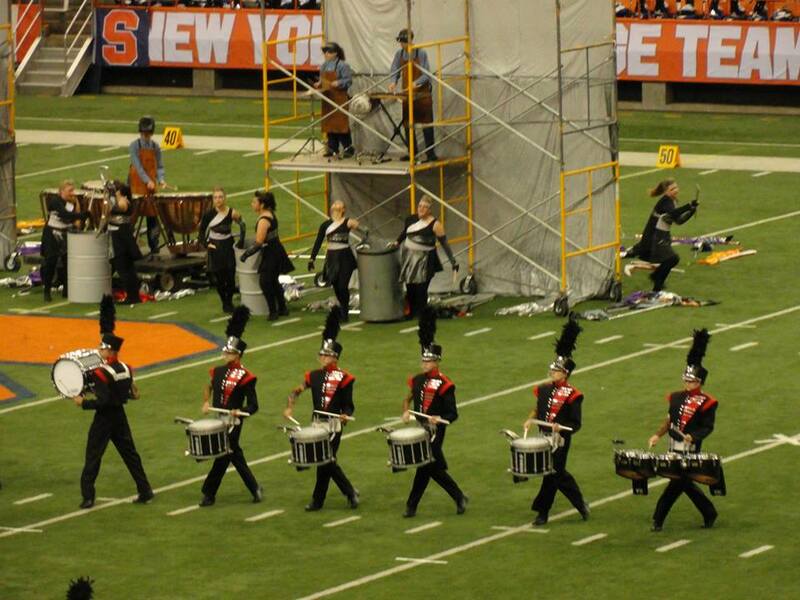 Now bear in mind every band has a total of 15 minutes to stage, perform and exit the field. The show itself is about 9 minutes. Do the math. 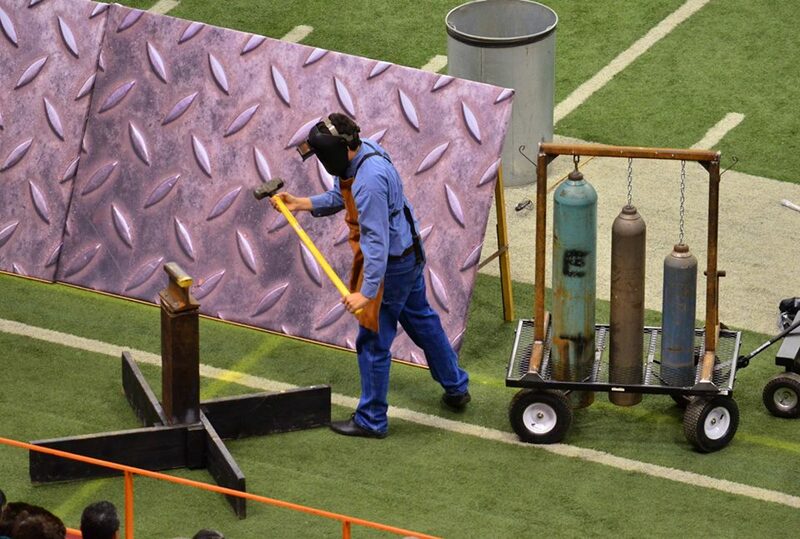 That’s 3 minutes at either end of the performance to get all that “metal” onto and off the field. Right, oh and during final competition it is pared down to 13 minutes. This show is breath taking in more ways than one. You can imagine the army of parent volunteers it takes to pull off a show like this. This years band numbers just under 15o students. That’s a lot of uniforms to keep clean, flags to repair, instruments to keep tuned, not to mention mouths to feed. Yes, every weekend when competition is local, we feed the kids a hot meal complete with “grab and go” snacks for the road trip ahead. Every weekend a big trailer is loaded with all the show components and a small army of “Pit Crew” (they used to call them the “Pit Dads” until several Moms joined in) all caravan to the competition site to stage the show, pack it up, get it home and gear up for the next rehearsal. Rain or shine or snow. Hello, this is Upstate New York. By October, snow flurries are always an option. If you don’t know how to dress in layers, you can’t live here. this crew is a tight knit, well oiled and more than slightly crazy team. My kind of family.